The Suzuki RM-Z250 has one heck of a pedigree in Australia and around the world. It took riders like Ryan Dungey and Jason Anderson to AMA Supercross Championships earlier in their careers while Justin Hill won multiple SX2 Main Events on one in 2018. The bike has always been easy to ride and one of the most agile. In recent years, the KYB PSF2 fork that came stock on the machine has been a thorn in its side. Air fork pressures are a nuisance to keep on top of at the best of times, but the PSF2 was notorious for fluctuating readings. The standout feature on the new Suzuki is the motor and the difference between the 2018 and the 2019 is amazing. The changes have translated into real-world improvements and there really is no comparison between the two engines. The bottom-end and mid-range power have both received a boost, but it is in the top-end where the biggest gains have been made. It is hard to know exactly where it’s all come from but my gut instinct tells me that the new down-draft style intake has helped the bottom-to-mid power while the new Mikuni twin injectors have helped up top. Overall this motor will be competitive against anything on the track. It comes on smooth and strong, and just keeps going. I found that the engine performed best when it was revved hard and kept up high in the rev range. In past years the Suzuki 250 has always performed best for me with the lean ignition coupler. But with the 2019 it was actually the opposite, with the richer coupler working the best and producing the most power. We found that with this coupler it was best to wind the idle up a fair bit to get the bike running clean off the bottom. The ergos for 2019 are super comfortable and extremely aggressive. Yes, they are exactly the same as the RM-Z450 but, for some reason, the 250 feels much nicer. The ergos on the 250 complement the power, frame and suspension changes and give a really comfortable ride. The seat has an extremely flat profile that allows you to climb all over the bike without any issues and the width of the machine feels just spot on. I found the footpeg/seat/handlebar relationship exactly right for me and I only had to roll the handlebar back a tad to find my sweet spot. The 2019 feels just as agile as the 2018 with some added stability that has been missing in recent years. 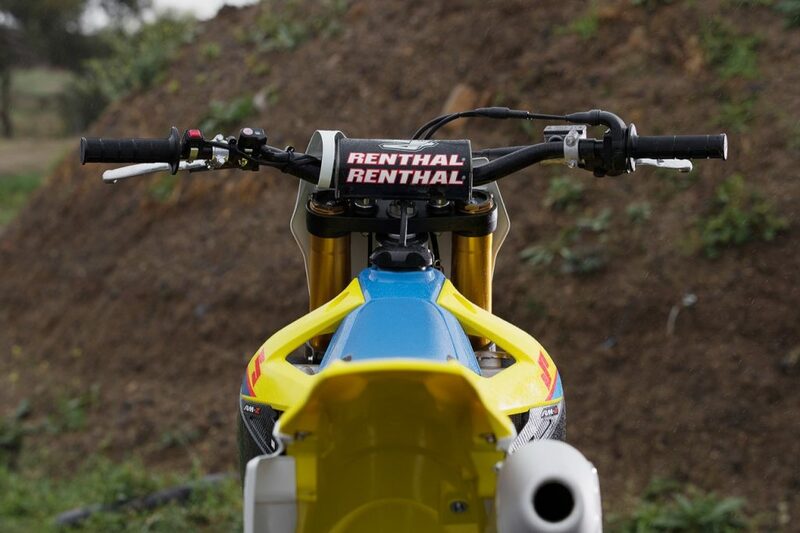 Suzuki has gone from having one of the worst forks to one of the best. The new KYB spring-cartridge unit gets the job done much better than the PSF2 air fork right until the last lap of the day, with very little fluctuation in stiffness along the way. Sure, it weighs a little more, but Suzuki has worked hard to counteract this increase by reductions in other areas of the bike (see breakout). 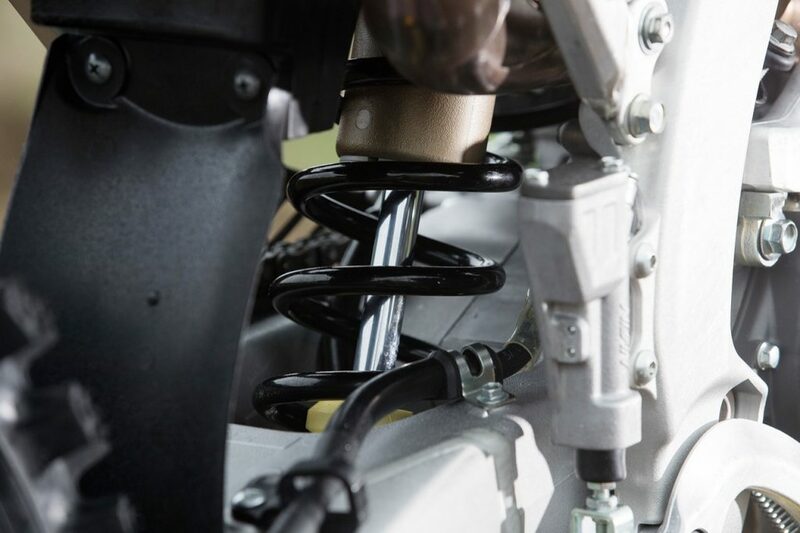 The front suspension is relatively easy to set up and most specialists will have a pretty good idea of what to do to set up the valving for you due to the fact that this fork has been around for quite a while. The action is superb. The KYB is at its best soaking up small, choppy bumps but I also found that big over-jumps and hard landers were no problem. Even when I was really hard under brakes the fork held up quite well. The compression and rebound damping adjusters are quite sensitive so you really don’t need to go any more than two clicks either way and you will feel a noticeable change in the action. Make sure you regularly bleed the air that can build up in the fork. 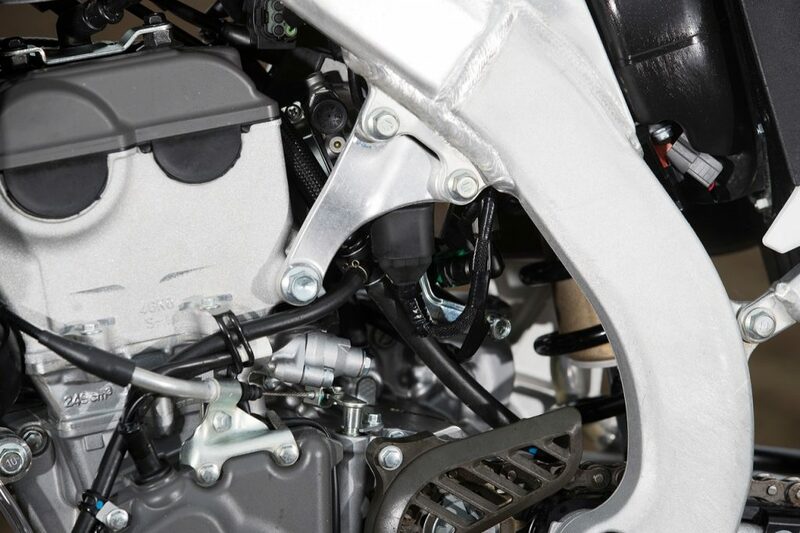 Suzuki has modified the S-HAC system on its 250 and it works exceptionally well. I haven’t been a fan of the holeshot assist systems that a lot of manufacturers have introduced, especially on the smaller MX2s, where I find you can use every ounce of power to launch out of the gate. 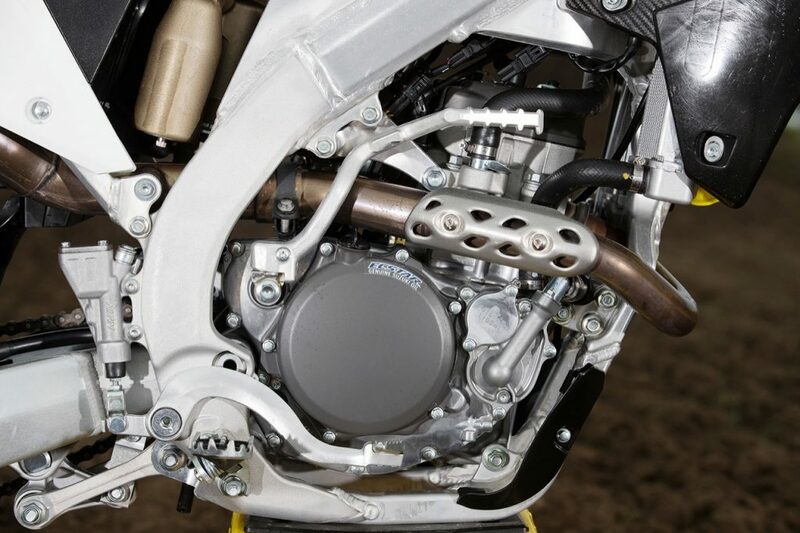 But I honestly found the new S-HAC holeshot system from Suzuki to work a treat. You activate the S-HAC map by pushing and holding the kill switch. By holding the button down for 0.7 of a second you’ll activate Mode A and the light will start flashing. By holding it for 1.8sec you’ll activate Mode B and the light will start flashing faster. Mode A limits the engine speed before the start for hard and slippery surfaces, like concrete start gates. B gives a more aggressive engine map and is for normal-to-grippy dirt. I was really impressed with Mode A and how easy it was to rocket out of the gate consistently. 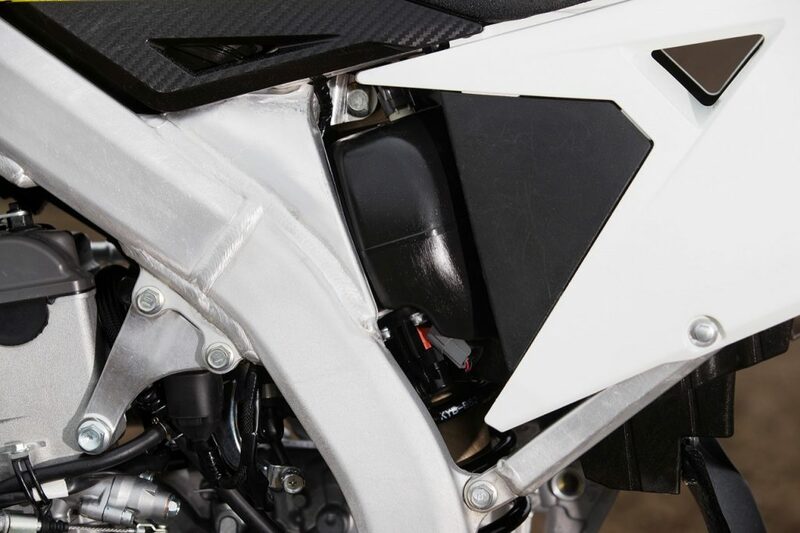 The principle is very similar to KTM’s Launch Control, where you basically hold the throttle wide open before releasing the clutch and the ECU restricts the maximum revs. It feels quite weird to hold the throttle wide open but it actually works a treat. Electronics can be amazing but I sometimes wonder if we are starting to rely on them a bit too much. 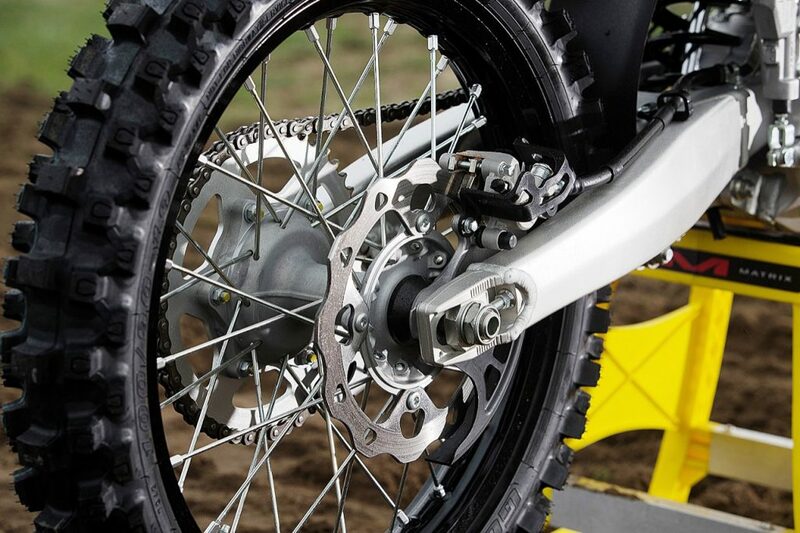 The monoshock is essentially the same as the 2018 KYB model. It’s not a bad unit and Suzuki has done a good job with the valving and spring rate. Having the rebound clicker on the main shock body is not the best system and I have always found that you get more effective rebound damping when the clicker is down near the clevis. The main thing to remember is that you need to have your rebound valving pretty much spot on as the adjuster is nowhere near as sensitive and you don’t have the amount of adjustment to do the job properly. That being said, the rear-end still worked well and was aided by a nice, stable chassis and that terrific fork. The rear-end tracked nicely out of corners where it would hold up well. There were no major issues with the back of the bike kicking around too much when entering choppy turns. I found 105mm of rider sag to work nicely for me with around 42mm of static sag. The 270mm front disc is a huge improvement over the 250mm unit on the 2018. The bike slows without any fuss. We had absolutely perfect conditions at Park4MX in Vicco, which meant that there was maximum traction on the back part of the track where we usually find rock hard, slippery surfaces. The tacky dirt meant that we could really put that front brake to the test and it stood up to everything we threw at it. The rear brake worked well and provided nice feel. There’s been a huge improvement over the 2018 model. The engine is a standout, along with the superb fork. The ergonomics and overall look of the yellow machine are also first rate. The big test will be when we put the whole fleet of 250cc four-strokes together for our 2019 ADB Shootout and only then will we see where the new Suzuki fits into the big scheme of things. It is safe to say we will see a much more competitive machine. • New cylinder head with revised intake ports. • Mikuni throttle body with twin underslung injectors. • Header pipe extended by 99mm. • Rear sprocket up one tooth. • Updated S-HAC (holeshot assist). • Engine rotated back by 8.5mm. • Engine mounts bolted to main frame rail rather than top of subframe. Brackets changed from steel to aluminium, reducing weight by 90g. • Frame rigidity increased and weight reduced by 370g. 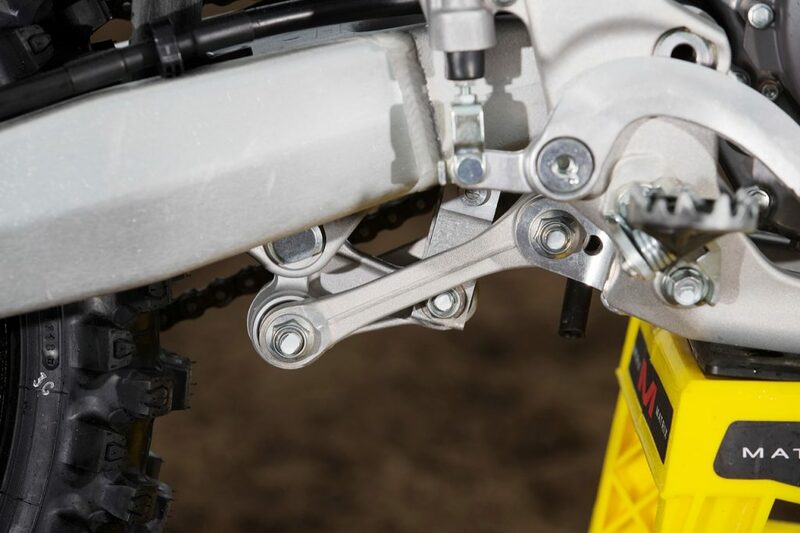 • New hydroformed swingarm with increased rigidity and less weight. • Footpegs moved 3.3mm forward and 5.2mm upward. • Handlebar moved 7.4mm forward and 3.8mm downward. • Straighter bend for the tapered alloy Renthal Fatbar. • 48mm KYB spring-cartridge fork. • 60g shaved off the top and bottom triple-clamps. 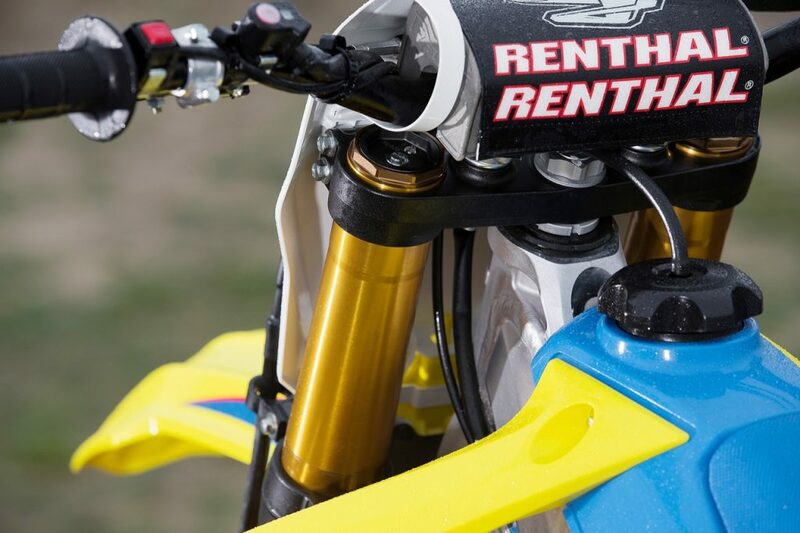 • New monoshock linkage ratio. • Rear spring made from thinner but stronger wire, saving 370g. • A larger diameter 270mm front wave disc. • New shape front and rear rims shaving 100g combined. 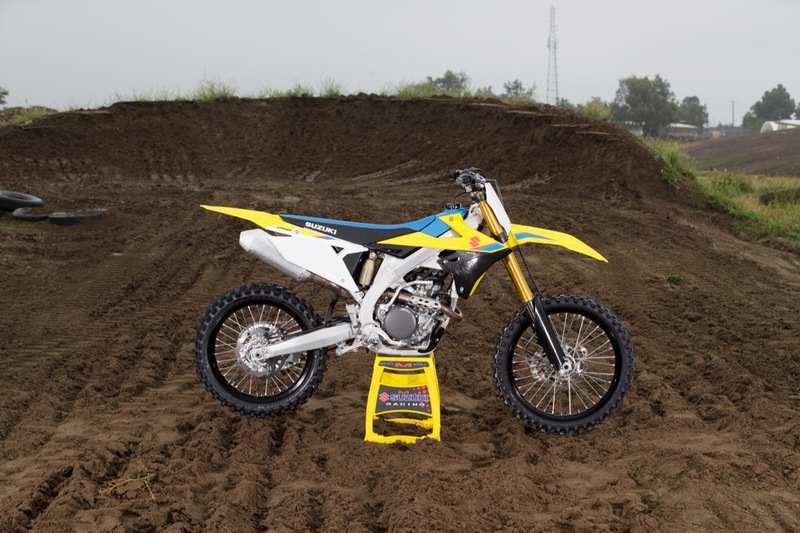 • Plastics shared with the 450 for the first time. • A larger air filter aperture for better breathing. • Fuel tank material changed from aluminium to plastic.